By nature, degus are very social and curious animals. They are social because they always live in groups. 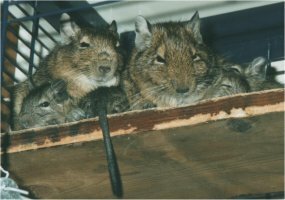 A degu that is kept solely will possibly develop behavioural abnormalities, that's why you should always keep at least two degus as pets. If you have more than one degu you will see that they lie on top of each other while sleeping, forming a pile. That's very nice to see. Degus are curious as well. If you give them a new toy, or if something unusual happens, the degus will always take a look. Sometimes, when the degus are scared, they hide in a safe place for a while, or they freeze. But in the end curiousity often wins, and their fear fades away. Degus are day-active, which means that they usually are awake during day-time, and they sleep at night. But degus have very short sleep cycles, with an average of about fifteen minutes. Their most active periods are early in the morning and late at night. In the afternoon they often sleep for a while. Almost anything that a degu can carry in it's mouth will be brought to the degu's nest. For example a piece of (toilet)paper, a toilet roll or twigs will be brought to the nest, and will be ripped into pieces over there. Sometimes this stuff is used to build a nest. In the wild, degus also collect everything they can find and make piles of it. It seems to be a habit of degus to make piles of stuff, and possibly a degu can gain status in it's group by having a big pile. It's very funny to see how a degu carries everything to the nest, especially when something is hard to carry, or when there are obstacles on the way to the nest (like stairs). 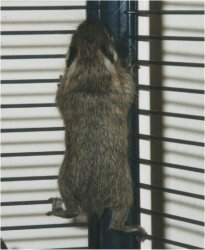 Degus don't give up very soon, and they often keep trying until they succeed. 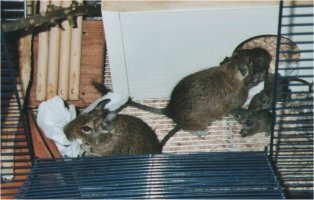 Degus communicate with each other (and sometimes with their caregiver) by making noises. They warble (a soft and sweet noise) when they like each other, and when they want to mate. When a degu startles you will hear a loud "Squeeeeeek!". The other degus react to this sound by freezing or hiding on a safe place. It seems to be a sort of alarm, with which one degu can warn the others for danger. Degus also make loud and less friendly noises when they are moody (and believe me, they really can be moody!). A degu can become moody when it is disturbed by another degu while busy, or when it hurts itself. Degus gnaw at everything ! Gnawing is a very important habit, because degus need it to keep their teeth short and sharp. A degu's teeth always keep growing, and when not cut (by gnawing) the teeth will grow into the degu's jaw. If this happens a degu cannot open it's mouth anymore, so it will not be able to eat. 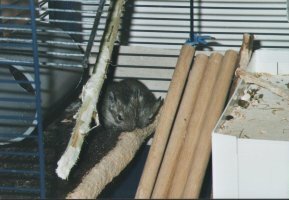 Usually degus are friendly and certainly not agressive to each other or to people. They won't bite, but they will try to gnaw at your fingers (remember, they gnaw at everything!). They do this out of curiousity and not out of agression. But their teeth are very sharp so if you're not careful they can really hurt you. You can try to teach the degus that they may not bite in your finger. Just tap the degu softly on it's nose when it tries to gnaw. It doesn't like being touched on the nose. Usually degus get used to their caregiver very soon. If you regularly feed them by hand and if you take them out of their cage once in a while, they'll soon get used to you and your scent. 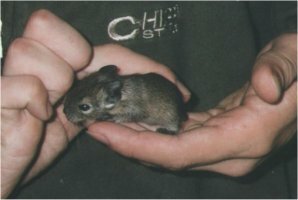 Degus are certainly not easy to pick up, because they are very lively. But if you are patient you can often pick them up and stroke them. But keep in mind that a degu never becomes as tame as for example a guinea pig, it's much too lively for that. A degu is certainly not suited for cuddling !